March 9th – 12th 2017: Braving an impending storm – fortunately, a forecast that wasn’t – over 800 archaeologists attended the 51st Annual Society of California Archaeology Meetings in Fish Camp, California, just outside Yosemite National Park on the western slope of the Sierra Nevada. Organized by Far Western’s Dr. Adie Whitaker (Program Chair), the overarching theme of “Sharing the Past” was vibrant throughout the venue and symposia. Friday morning’s Plenary Session included a stellar line up of speakers sharing highlights of recent research in the foothills and mountains of the central and north-central Sierra. The Plenary Session officially opened the 2017 meetings as Dr. Eric Wohlgemuth of Far Western discussed the challenges of archaeological field methods in California’s conifer forests. Eric spoke alongside Diane Gifford-Gonzalez, Carly S. Whelan, Kathleen L. Hull, Reba Fuller, Brian Codding, Ron W. Goode, and Mary L. Maniery. The meeting then dispersed into a buzz of presentations, posters, forums, and roundtable discussions. Far Western contributors and participants provided strong presence throughout the weekend. As the meetings closed on Sunday, Far Western past-President Bill Hildebrandt took on a new presidential role, joining the SCA Board as Incoming President. Bill begins his service this year as a member of the seven-person board and will serve as President of the SCA from 2018-2019. In addition to behind the scenes work organizing the program by Adie Whitaker, Production Supervisor Nicole Birney produced the program using a database designed by Partner Jay King. A special thank you to Nicole Birney and Jay King for assisting with program organization and to Tammara Norton for contributing to our 2017 SCA presentations. 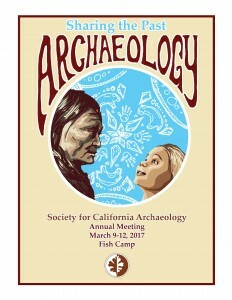 The Society of California Archaeology has chosen the theme “Sharing the Past” for the 2017 meeting, to bring the membership together and to identify what unifies the past and present. This symposium will focus on different aspects of studying gender in archaeology and how this translates to modern-day gender issues. Topics include the history of women in the field of California archaeology, feminist perspectives on archaeological thought/theory, and how prehistoric/historic gender roles are revealed in archaeological assemblages. The goal is to bring forward new perspectives on old theories, and shed light on modern issues in our field. In 2015, Far Western conducted salvage excavations along US 101 in Goleta after Caltrans construction workers exposed a buried portion of CA-SBA-1703. The site was an Early Period midden found within an extremely disturbed context. Departing from the traditional CRM reporting format, Far Western produced a concise volume with abundant graphics intended to be used primarily by college educators seeking to introduce their students to archaeological practices using a contemporary, realistic, and unexpected scenario. The volume highlights challenges often encountered by archaeologists working on project-driven excavations. This poster session presents selected issues and findings documented in that report. Interesting characteristics from flaked stone assemblages recovered during the Ruby Pipeline project portray varied production patterns across the northern swatch of Nevada. Single-component assemblages reveal a transition from obsidian dominate landscapes in the west to cryptocrystalline silicate areas in the east over time. Data from these areas support several trans-Holocene changes in tool stone selection, production intensity, and reduction strategies which can be linked to broader changes in demography, land-use patterns, and work organization – most notably, the changes that occur late in time when the intensity of flaked stone production crashes and people’s interest in biface reduction declines as well. Investment in boating and netting technology intensified on the shores of Goleta Slough and other central coast estuaries in the Middle Holocene. Most of this activity focused on estuary habitats, but the technology was applied to relatively deep water settings beyond the kelp beds from time-to-time as well. Exploitation of these deeper water habitats did not occur among people living in outer coast settings away from estuaries, probably because the economic returns from deeper water habitats alone did not justify the construction of watercraft required to reach them in a safe and productive manner. A large, Late Period, deer tibia bone whistle was the first item seen by the archaeological monitor after being called to SBA-1703. Chumash informants nearly uniformly associate this type of flute with `antap ceremonies. Regional studies have identified an increase in flute size, along with deeper tones, over time, to be more effective during ceremonies where large numbers of people were present. Many of these flutes have shell beads applied to them with asphaltum, and several additionally have leather wrappings. Researchers have long recognized that some coastal estuaries have contracted during the Holocene due to sedimentation. However, the timing and maximum extent of a former estuary is difficult to determine without extensive subsurface exploration, which has not yet been conducted in the Goleta Valley. Early archaeological and geological studies hypothesized that at one time Goleta Slough covered a vast area, extending inland to CA-SBA-1703. This is despite historic mapping depicting the site several kilometers away from the estuarine margin. Through a detailed review of existing data sets this hypothesis is critically analyzed. Working at SBA-1703 was not for the faint of heart. Crew members contended with a constricted work space along the margins of a yawning construction pit, hemmed in by an active railroad corridor on one side and a major freeway on the other side. Archaeologists improvised ways to safely access the preserved portions of the site without compromising scientific methods. Two buried, fire-affected rock features were found only a few meters apart at SBA-1703. Each contained faunal bone and shell, as well as charred nuts and seeds. However, radiocarbon dating established they were separated in time by a span of about one thousand years. Both features demonstrate that estuarine shellfish and small schooling fishes were important dietary constituents. However, the earlier feature (ca. 3829 -3637 cal BP) shows an emphasis on islay nuts while the later feature (ca. 2750-2180 cal BP) indicates that the diet had shifted to a stronger emphasis on terrestrial game, primarily deer-sized animals. Charred plant food debris and indices from the Santa Barbara mainland coast decline markedly with intensification of marine resources at about 6,000 years ago. The decline in plant vs. marine foods is strikingly similar to patterns seen about 3,000 years later on the eastern and northern San Francisco Bay shore. In both regions, plant food debris and indices increase millennia after marine food intensification, at ca. 3000 BP on the Santa Barbara coast and after ca. 1000 BP along San Francisco Bay. These patterns are relevant to the priority of aquatic faunal resources posited by Keeley (1991). 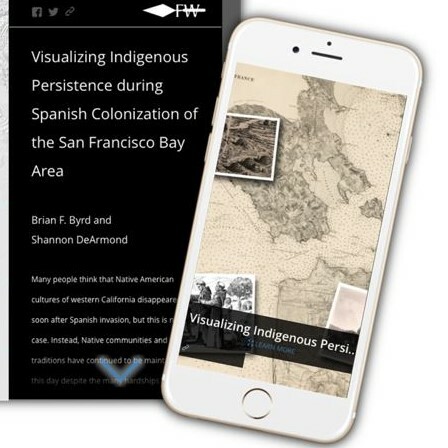 This paper provides a framework, largely through modeling and visualization, on traditional indigenous village persistence in the San Francisco Bay-Delta region. We explore spatial variation in the pace of colonial impact during a 50-year period using Milliken’s Community Distribution Model of Spanish Mission baptism data. In particular, we focus on the tempo of ancestral village and abandonment, highlight areas where decades of continuity in occupation after 1776 are expected, and areas where more nuanced Native persistence is anticipated. Finally, we touch on archaeological implications of these movements and persistence, and potential approaches to investigate these complex patterns. Men’s ability to gain prestige in their communities, primarily through hunting and other forms of resource gathering, is well-substantiated in the archaeological record. But a woman’s ability to gain prestige or authority, particularly while providing caring for offspring, is an issue that has received far less attention. An analysis of the archaeological record from a socio-behavioral perspective suggests that modern women do not have a monopoly on prestige-gathering, and that prehistoric women also exhibited competitive behavior aimed at attracting mates through the collection and storage of resources, basketry/textile design, and settlement patterns. Smoke Creek Canyon contains an extensive complex of petroglyphs, including the “Bruff’s Rock” site, originally described in 1850 and thought to be the first California rock art ever described by a Euro-American. A recent survey reveals a rich and varied archaeological record in close association with the petroglyphs, including an extraordinary quantity of milling tools, as well as large residence-sized rock rings and other features. This close association between rock art and residential features offers the opportunity to comment on both the likely age and the social context of the rock art’s production. What’s Left to Say about Ground Stone? Soaproot (Chlorogalum pomeridianum): Miracle Plant or Just Another Dirty Little Root? Among ethnographically important California plants, soaproot (Chlorogalum pomeridianum) receives little attention, despite use as a food, medicine, mastic, dye, source of fibers, detergent, and fish poison. In an effort to explore this dichotomy we provide a quantitative assessment of soaproot’s value, detailing its nutritional composition, collection costs, and effectiveness as a toxin. We show that return rates are high and effectiveness as a fish poison low. Given these points we would expect soaproot to have been widely consumed, but almost never used as toxin. We conclude by discussing the implications of these points for our understanding of prehistoric soaproot use. Bedrock mortars are ubiquitous throughout California and their function has been a longstanding question for archaeologists. Many have assumed a function associated with acorn intensification, but McCarthy took the time to conduct an in-depth ethnographic study on their function. It was this work that helped inspire my own research into bedrock mortar function, and gave me a start in questioning the assumptions about other often-dismissed cultural remains such as fire-cracked rock. This paper will present the starch grain analysis of bedrock mortars research conducted for my master’s thesis that was partly inspired by McCarthy’s landmark work, and the future avenues. The conifer forest zone of the Sierra Nevada can be a difficult place to do archaeology. Even for sites with well-defined component areas, the dearth of subsurface features with associated datable organics obscures accurate dating of artifact assemblages. Further, the lack of well preserved faunal remains, and the difficulty in associating plant macrofossils with artifact assemblages, limits subsistence reconstructions. Data recovery excavations at CAL-277/H at Big Trees State Park attempted to solve these problems through large block exposures, selective recovery excavation, stratigraphic excavation for fine-grained samples, large-scale flotation sampling, and starch grain recovery from bedrock milling features and grinding tools. Archaeobotanical remains collected from sites in Santa Clara Valley follow trends seen in sites throughout interior Central California. Early period sites exhibit generalized and balanced use of nuts and berries with minor use of small seeds, followed by intensification of acorn in Middle Period sites, culminating in intensive use of both acorn and small seeds in Late Period sites. Middle Period site CA-SCL-677 is unique in having very abundant small seeds; possible reasons for the anomaly include habitat, site use, and population density.